According to the minutes of Grand Chapter for the year ended May 19 1830, Lodge 84 had applied for a Royal Arch Warrant, but listed among those who had not yet paid for the document – they must have paid after the minutes were written as the entry was subsequently ticked. Royal Arch Chapter No. 84 was constituted on October 26 1831. However, surviving correspondence from June 12 1829, written on behalf of the principal Royal Arch Masons belonging to the three Masonic Lodges then working in Bandon – Nos. 20, 84 and 156 – show a wish being expressed to obtain a Royal Arch warrant or charter for Bandon at that time. A further letter, dated November 27 1829 from Jeremiah Biggs, Secretary of Lodge No. 84, formally requested this warrant, affixing the names of nine qualified brethren. In the event, Royal Arch Chapter warrants were issued for both Lodge No. 20 and No. 84, Bandon but the brethren of both lodges, having consulted together, unanimously agreed that it would be to the advantage of the Order that they should unite together under one Royal Arch Chapter, to be attached to Lodge No. 84, and furthermore agreed upon the Bye Laws for the government of their united Chapter. The first meeting of the united Chapter No. 84 was held at the Devonshire Arms, Bandon on Wednesday February 2 1831. 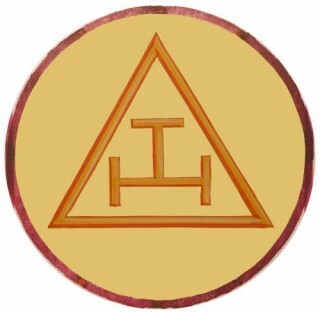 That meeting passed a draft letter to the governing body of Royal Arch Chapters in Ireland, subsequently sent February 5 1831, justifying the union of chapters at Bandon, ‘that by so uniting, the interest and the dignity of the Order would be advanced, a more numerous and respectable chapter obtained and greater attention and regularity would be ensured in the admission and exaltation of candidates than by working separately in the respective chapters attached to both Lodges’. It is thus clear that there had been Royal Arch activity at Bandon prior to 1829, but held within lodges without their own regalia. The united Chapter that was constituted in 1831 at Bandon remains the second-oldest Royal Arch warrant in the province. Through the first half of the 1830s, the chapter was busily admitting members, particularly a number of members of the Bandon garrison but within a short time, from 1835, the chapter activities declines with some meetings adjourned due to poor attendance and some years, just one meeting took place to elect officers or to allow officers to continue from the previous year. Indeed, the minutes of December 27 1843 state ‘in consequence of the difficulties of the Mother Lodge [No. 84], it was ordered that a balance of £8 9s. 1d. should be handed over’. There was no reference, however, as to what these difficulties were or the circumstances that caused them. Following the annual election of officers meeting of February 11 1845, Royal Arch Chapter No. 84 appears to have entered a period of dormancy lasting some 27 years, during which the Warrant was allowed lapse. Indeed, a minute of Lodge No. 84, dated June 26 1858, states ‘Grand Lodge, having ordered in the Royal Arch Warrant, the same was sent to Grand Lodge, and a receipt got for it. The next entry in the minutes of Royal Arch Chapter No. 84 dates from 1872, when a ‘meeting of some of the surviving Royal Arch Masons of Lodge No. 84 was held this day to arrange for the revival of the Warrant [and] that summons be issued for an Encampment on Wed. 29th inst.’ Following this meeting, a letter dated May 30 1872 was sent to the District Grand Secretary, which stated ‘the adjourned meeting of Royal Arch Masons’s of 84 (which I should have said was to be for a chapter, not encampment) was held yesterday, and as all are anxious, now that we have at last got the warrant into our possession, to restore it to its former state of efficiency and working order, we found it necessary, with that view, to further adjourn till Thursday 6 June.’ In the event this proposed meeting was delayed, as the Chapter was not successful in obtaining two installed Principals form Cork to aid in legally reopening the Chapter; on July 12 1872, the Companions of Royal Arch Chapter No. 84 assembled in the Lodge Room in the Devonshire Arms Hotel at 1.00 pm. The R.A.C. attached to your lodge, having not made any returns for many years, was suspended last night by Grand Chapter and it is desirable to have the Warrant lodged here. I would be greatly obliged if you would make enquiries as to its present whereabouts and forward it, if possible. And so it remained until ten years later, in 1895, when a group of visiting brethren from Lodge 385 Clonakilty stated they were applying for a Royal Arch Chapter warrant and suggested that Lodge 84 should do the same and that by a united effort the chapter could work successfully and well. After some discussion it was decided to postpone the matter for at least twelve months, during which the Clonakilty Chapter (No. 385) Warrant was issued for a second time on May 2 1895, having been originally registered in 1830 and having been returned in 1858. In the event, no attempt was made to resuscitate the Chapter in 1895 or 1896; indeed it would be over a decade before such a move was made. During 1909, it was made known that the old warrant, being still in existence, with a debt of £8 attached, would most likely be available to the brethren if an offer of £5 was made. Correspondence of July 27 1909 reveals the date of issue of the original warrant of R.A.C. No. 84 was March 9 1830, even though according to the registry it was October 26 1831, which appears to have been the date on which payment was finally made. Finally, in October 1909, a decision was made that the secretary prepare a memorial to Grand Lodge for the return of the old warrant, on payment of the agreed amount; in March 1910, the warrant was duly returned. Our chapter was formally reopened on July 20 1910 and progressed well during the 1910s, when a considerable number of both military and local brethren were admitted to membership. Chapter met regularly – as often as six meetings in 1918 and ten in 1919, such was the level of interest – until March 3 1922, when the officers for that year were installed. The civil war being waged made meetings impossible that year and the annual meetings of 1923 and 1924 were held at Cork. Our original warrant was destroyed (one assumes during civil war disturbances at Bandon in August 1922) and the duplicate currently in use was issued by order of Grand Chapter on February 6 1924. In December 1924 the Grand Master’s Restoration Fund made a donation of £50 to assist in replacing property lost to the Chapter during 1922 and meetings recommenced in early 1925 in Bandon, during which six meetings were held at Shannon Street School. 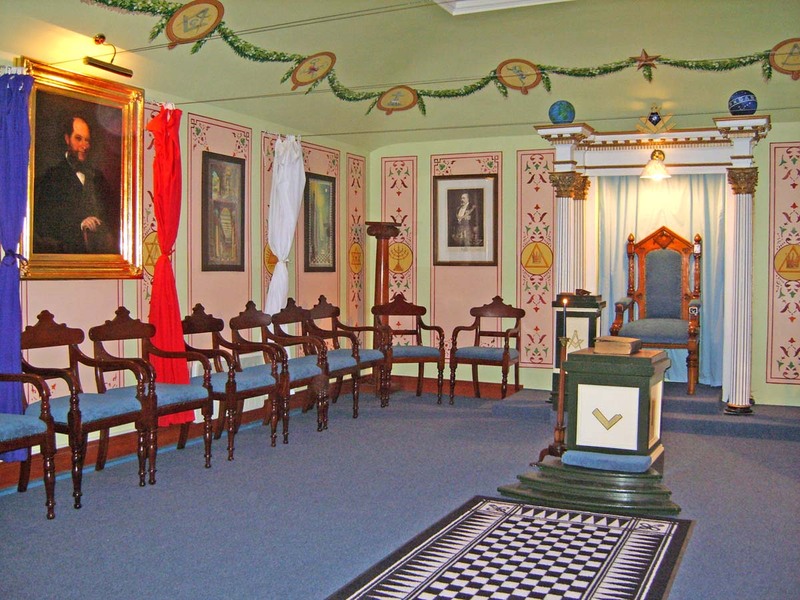 The first Royal Arch Chapter meeting in the restored Masonic Hall at Bandon took place on April 20 1927 (lodge meetings having resumed there the previous year, following rededications ceremonies). A feature of the period up to the Second World War was the regular attendance of 10-12 members, besides visitors, particularly by District Grand Officers, who were in evidence at almost every meeting. This trend continued throughout the war years despite the difficulties of travel (there was also a train from Cork to Bandon, and some brethren took this option, then cycled back to Cork). During the post-war years, particularly during the 1950s, attendance at chapter greatly declined; indeed in 1949 the Royal Arch Chapter No. 15 at Skibbereen ceased working and Bezaleel Royal Arch Chapter No. 234 transferred from Kinsale to Cork in order to remain operative. At Bandon, visitors often outnumbered members, sometimes by a ratio of two to one, so that, in February 1960, a discussion took place as to whether Chapter 84 should continue to operate. Owing to insufficient attendance, two previous meetings had proved abortive and it had proved impossible to elect new officers for 1960 (those for 1959 remaining in place). Yet it was the unanimous feeling that the Chapter should continue to operate and that an attempt be made to increase its membership. With the ardent support of the members of the District Grand R.A.C., who were most assiduous in attending chapter at Bandon, numbers gradually increased over the years so that one of the oldest chapters on the registry of Ireland rose from the ashes for the third time. Having met from 1831 to 1845 and again from 1872 to 1875, it is only since 1909 that a lengthy period of continuous operation has been achieved. R.A.C. No. 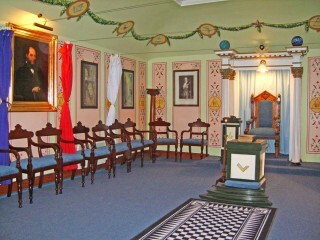 84 met at the Masonic Hall in the town of Bandon until 1988 when, along with Lodge No. 84, it moved to the present premises at The Old Schoolhouse, Brinny, some 5 miles from the town. In more recent times, when renovations at Brinny necessitated the obtaining of alternative premises and the Skibbereen brethren offered their lodge room, a compromise was reached whereby two of the quarterly convocations of Royal Arch Chapter No. 84 are held at Skibbereen and the remaining two at Brinny, in rotation. All visiting Royal Arch Masons are welcomed at Convocations of Royal Arch Chapter No. 84, and all Master Masons – of at least one years standing who are not already members of this branch of the Masonic Order – are warmly encouraged to apply for membership.